The Emerald Series servo drives and motors use the latest servo technology to bring cost effective solutions to the automation market. A wide range of sizes and feature rich functions make the Emerald servo drive the most versatile servo system in today’s automation market. State of the art software minimizes hardware cost while maximizing features and performance. The Emerald servo drive is a certified SERCOS II drive designed to integrate with any industry standard SERCOS II controller. 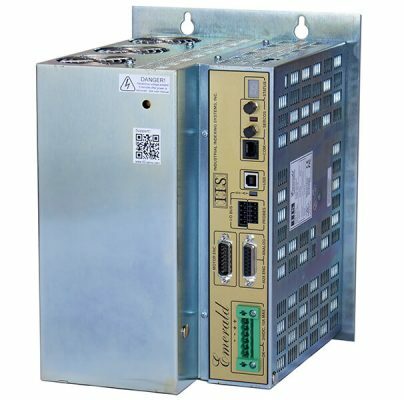 The SERCOS II standard forms a fiber optic isolated network and when interfaced to the IIS Emerald Automation Controller, this drive is part of a network of up to 32 servo drives or I/O devices with a minimum 500 micro-second scan rate. The Emerald Servo Drive is available in 7 size ranges: 5, 10, 20, 40 and 60 amp @ 220 VAC and 25 and 50 amp @ 440 VAC. Emerald servo motors are available from 400W to 21kW, 1500 to 3400 RPM rated speeds with low and medium rotor inertia versions. Auxiliary encoder, ABZ RS422 interface with an optional resolver interface also available. Two high-speed position “trap” inputs for storing encoder position relative to a sensor to provide web or product registration functions. Extended I/O bus will interface up to two Emerald 16 position I/O racks providing an additional 32 I/O points per drive. Two rack types are available to meet AC, DC, low voltage, and high voltage requirements. All drive I/O become instantly available to and controlled by the automation controller on the SERCOS II Network. Watchdog timer with safety loop contact for external shut-down control. High-speed DSP microprocessor for position, velocity and torque loop control. Selectable current loop switching frequency; Choose the 16 KHz frequency when maximum performance and minimum audible noise is required or choose either 4 or 8 KHz for maximum power. USB port for easy interfacing to laptop PC for drive diagnostic and setup procedures. Designed to operate at temperatures of up to 55C° at full rated power.